Jurassic Park was a franchise that was destined to be popular. The technology to create that movie and the subsequent sequels that followed, allowed the child in all of us to be wowed by their realistic Dinosaurs and the worlds they would inhabit. From outpacing a T-Rex in a speeding Jeep, to avoiding the deadly claws of a Velociraptor, Jurassic Park was always going to be a classic. While the second and third movies did rather well, they are not generally the favorites among many. Jurassic World, the fourth in the franchise, did insanely well at the box office, and apart from having a few problems, was a much better film than the two that had come before it. Fallen Kingdom, the fifth and latest entry, attempts to further that story but dwells too much on borrowing moments from the original film instead of offering us entirely new and iconic scenario's. That being said, the conclusion to the film does open the franchise up to mostly uncharted territory. One could argue that while Jurassic World set up the premise, the next movie in the series is the one they wanted to make all along. Fallen Kingdom takes place three years after the events of Jurassic World, a fact that is explained to us through a generic BBC News bulletin that is used to get us up to speed. These moments of exposition can often be a clever way to relay prior information to the viewer, but the way in which it is shown to us here comes across as extremely cliche. While it may seem like I'm about to rip into this latest sequel, that's only partially the case here as Fallen Kingdom does a lot of things right and more often than not, offers us up a very entertaining, yet wildly predictable film. The premise of the film has Isla Nublar, the fictional island that Jurassic Park has taken place on, about to have its volcano's erupt and cover the entire island in very hot lava. This causes a rescue team to be sent to the island to save as many species as possible before it is too late. While there are certain aspects of where the story goes that I won't get into via this review, due to spoilers and what-have-you, I was pleased that much of this movie centered around the relationship between Chris Pratt's Owen Grady and Blue, the Velicoraptor he had raised since birth. This was one of the best aspects of Jurassic World, so it was fantastic to see how well it was handled here. While we get a few other characters from the previous film, the only real standouts are Chris Pratt and Bryce Dallas Howard, the latter who is back once again as Claire Dearing, this time outrunning Dinosaurs in regular shoes instead of her heels. Despite appearing in the film as a central character, I almost feel as if the Director, J.A. Bayona, didn't know what to do with her as she is often pushed to the background of the film in several big moments. Chris Pratt is front and center once again as the charming and likable Owen Grady, who commands each and every scene he is in. Chris Pratt is one of the biggest movie stars in the world right now, so I am not surprised by the amount of attention he gets not only in the story but in how the movie is framed around him. The supporting cast here is unlikely to be remembered going into the next film, apart from, at least in my opinion, Danielle Pineda, who portrays the Dino-vet, Zia Rodriguez. Danielle was not only one of my favorite characters in the movie but might be one of my favorite characters in the whole franchise. What is interesting about her character is that while she is trained in Dinosaur biology, she's never once seen one of these creatures in person before. I found her incredibly witty, full of energy, and a true pleasure to watch on screen. I'm hoping that they bring her back for the upcoming sequel. The remaining cast, as I've said, isn't nearly as memorable. Justice Smith, as Franklin Webb, spends most of the movie regretting that he tagged along to the island, and frankly, I shared that sentiment. He is nothing more than the stereotypical character who spends the entire movie complaining and is there mostly for the comic relief. James Cromwell is here as Benjamin Lockwood, a character written into the back-lore of the first movie; as it is told to us that he worked alongside John Hammond to create the first Dinosaur clone. His money and estate are managed by Eli Mills (Rafe Spall), a character I didn't really care for and follows your typical paint-by-number tropey character traits for the role they place him in. 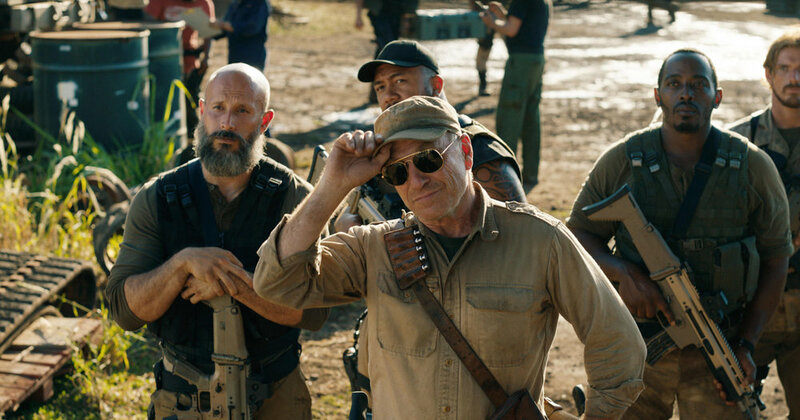 When the team first arrives at the island, they are introduced to Ken Wheatley (Ted Levine) who is desperately trying to do his best Deniro, right down to the same facial mannerisms, and due to this, offers up more of a parody of the actor than anything entertaining here. Lastly, while Jeff Goldblum is back as Ian Malcolm, nearly every scene he is in has been shown in the trailer and while it is great to see him back, the fact that his entire screen time is during a court scene, there is nothing here to convince us he is playing the same character, other than in name only. This could have been footage from any courtroom drama and never once feels like it belongs as part of the movie. The real stars of the show, the Dinosaurs, are fantastic and it was great to see so many different species featured here. As an avid fan of the Jurassic World Alive mobile game, I started to see so many of the Dinosaurs that I have interacted with via the game and a few feature pretty predominately here, especially the Stygimoloch, which completely steals every scene of the film it is a part of. There is a moment at the end of the first act that will have your heart ache with sorrow and compassion that was handled so perfectly that I'm not sure there was a better way to film it. The special effects for the Dinosaurs are at their best as the extinct creatures have never looked better. If you head into Jurassic World: Fallen Kingdom wanting to see Dinosaurs, you will not be disappointed. While the first act of the movie is very similar to what we experienced in Jurassic World, the final act raises several questions and keep in mind I won't be dishing into the actual ending, but the events that lead up to it. Should you consider any discussion about this moment in the film as a spoiler, then just skip ahead to the next paragraph. As the Dinosaurs are being auctioned off, I couldn't help but laugh at the drastically low prices they were going for. When they start the bidding off at 2 million for one such creature, I was surprised that it didn't go for a hundred times that, considering the crowd is supposedly filled with some of the richest people in the world you would figure these deadly creatures would go for more than what it takes to fund a Super Bowl Ad. 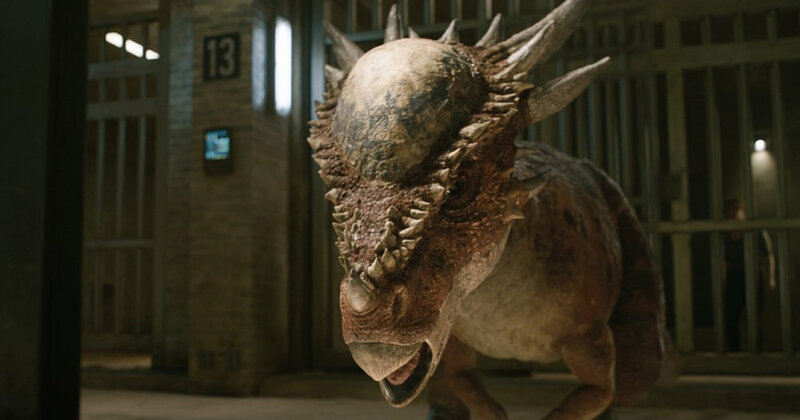 When we are finally shown the Dinosaur that the movie is built around, it's unclear how recent it has been made or how much time has passed since the retrieval of the core item needed to make it. It raises a lot of questions that the film simply glosses over. While the creature is talked up to be the most advanced hunter ever manufactured, it can't seem to find someone who is pretty much in the same room. There is so much to pick apart from this film and I haven't even mentioned the other big reveal. Director, J.A. Bayona nails all the action required to make an entertaining movie as the film certainly has some very intense moments. Having a pair of characters running away from a Dinosaur in a room filling up with lava, to the final epic confrontation that had me on the edge of my seat, While Fallen Kingdom can certainly entertain on an action level, It is when the film slows down and starts to rely more on its human cast that it just doesn't remain consistently enjoyable. While packed with numerous flaws and only a small handful of interesting (human) characters, Jurassic World: Fallen Kingdom still manages to be very entertaining regardless of the fact that you will see everything coming a mile away. It makes wonderful use of its Dinosaur cast, with the return of more than just one familiar face. The movie is split into three very different acts with only the first and third of them being what you want from a Jurassic Park movie. It has some pretty interesting reveals that will certainly look to enhance future movies, but what makes Fallen Kingdom so good is what has made each film so wildly entertaining; Dinosaurs.